Every Spring my excitement for strawberries overshadows my sorrow for the dwindling citrus season. It’s so weird. 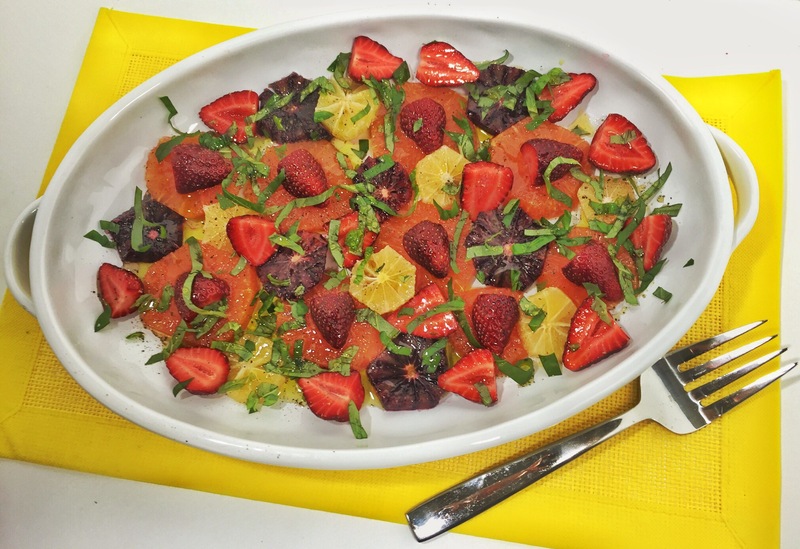 I feel like juicy, bright-colored fruit, like citrus, should be celebrated in the summer. And I guess it is, hello lemonade. Growing up in Florida I took for granted the ability to pluck an orange from the tree whenever I wanted. I mean, I never really thought about most of the fruit being in season in the winter. Then again, winter in Florida basically feels like spring and summer in Florida. But I digress. The presence of blood oranges, cara cara oranges, and my beloved Meyer lemons is fading in stores, and this year I wanted to send them out in style. I felt like a seasonal salad was in order. You’ll need a platter, preferably a white one. It shows off the colors. You’ll do all of them the same way. Slice off the ends. Set the fruit one of the flat sides. Then cut down the sides to remove the peel and the white pith. Do this carefully so you don’t cut into the flesh. 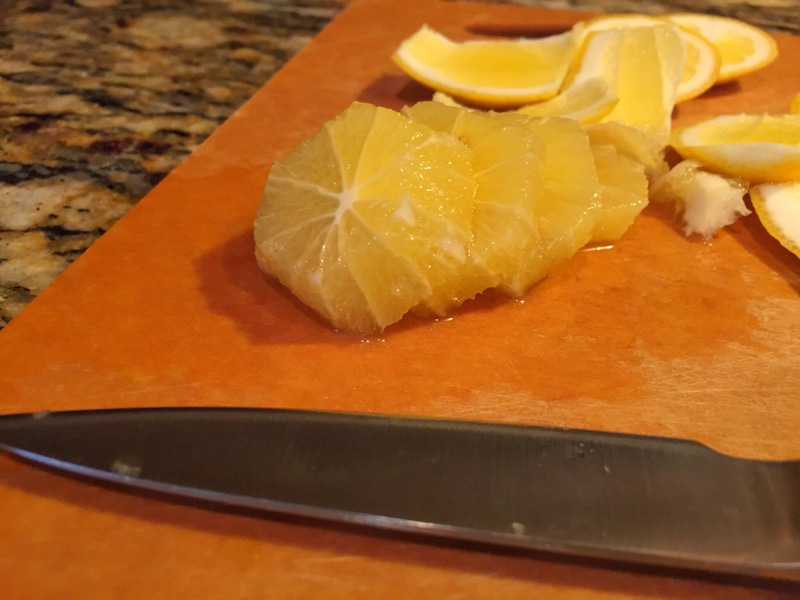 When the pith and peel are gone, cut the fruit into slices. 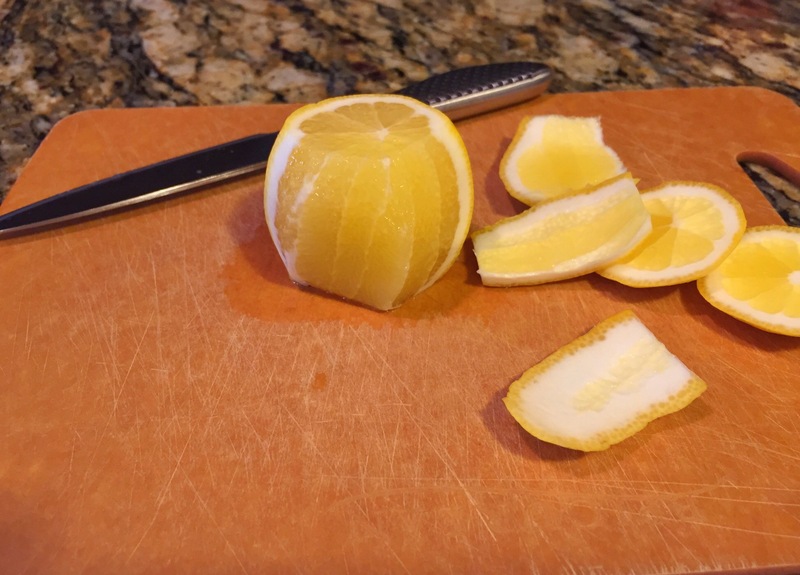 Remove any seeds you see in the slices. 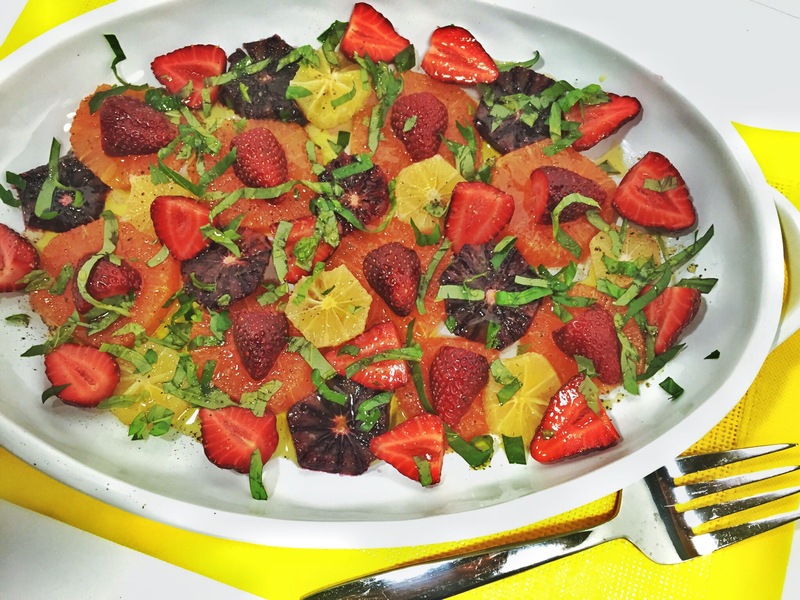 Set the slices of citrus all around the platter. Be artistic. Now remove the tops from the strawberries, and cut each berry into half. 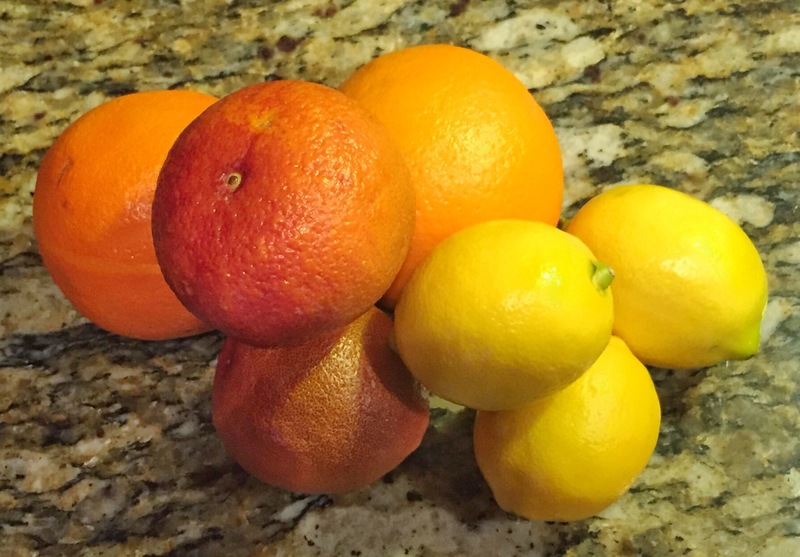 Arrange them around the citrus slices. Drizzle the oil and honey all over the fruit. Make ribbons of basil. Do that by stacking the leaves, rolling them up, and slicing down the roll. Sprinkle the basil ribbons all over the platter. Serve. Every bite is sweet, tangly, and fresh. This salad is so simple, yet so juicy and bright. 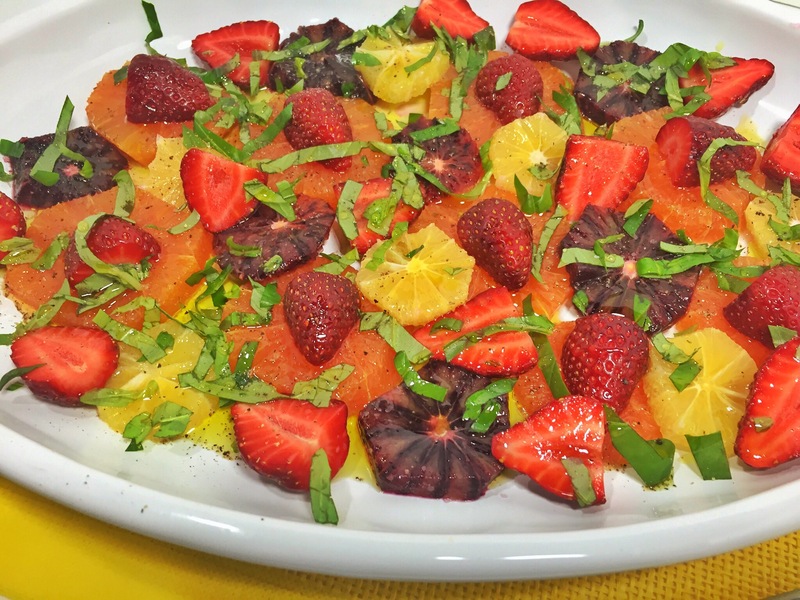 The oil, honey, basil, salt, and pepper mix with the citrus to mimick a vinaigrette. You could easily substitute fruit here. 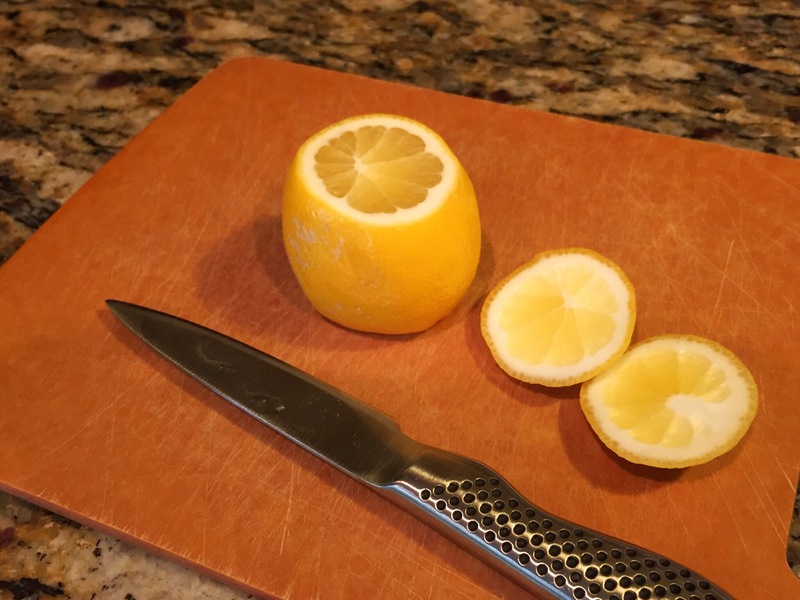 The Meyer lemon is tart, but semi-sweet. If you love grapefruit, you could use that instead. You could use any kind of orange. Kumquats could be good, too. When blueberries come out, use them instead of, or in combination with, the strawberries. Always be thinking color. You want variety. Serve this as a side dish at lunch or dinner. Enjoy it alongside a frittata or quiche for brunch. Bring it to a party. You could even put a serving of the salad on a big scoop of vanilla ice cream for dessert… don’t knock it till you try it, OK? Tip: Try this with flavored olive oil. Lemon, orange, lime, and basil infused oils would be wonderful! You could even get daring and use half chipotle olive oil with half traditional extra-virgin.